According to the cosmological principle (CP), Universal large-scale structure is homogeneous and isotropic. The observable Universe, however, shows complex structures even on very large scales. The recent discoveries of structures significantly exceeding the transition scale of 370 Mpc pose a challenge to the CP. We report here the discovery of the largest regular formation in the observable Universe; a ring with a diameter of 1720 Mpc, displayed by 9 gamma-ray bursts (GRBs), exceeding by a factor of 5 the transition scale to the homogeneous and isotropic distribution. The ring has a major diameter of 43° and a minor diameter of 30° at a distance of 2770 Mpc in the 0.78 < z < 0.86 redshift range, with a probability of 2 × 10−6 of being the result of a random fluctuation in the GRB count rate. Evidence suggests that this feature is the projection of a shell on to the plane of the sky. Voids and string-like formations are common outcomes of large-scale structure. However, these structures have maximum sizes of 150 Mpc, which are an order of magnitude smaller than the observed GRB ring diameter. Evidence in support of the shell interpretation requires that temporal information of the transient GRBs be included in the analysis. This ring-shaped feature is large enough to contradict the CP. The physical mechanism responsible for causing it is unknown. In my opinion it’s not a ring at all, but an outline of Australia. 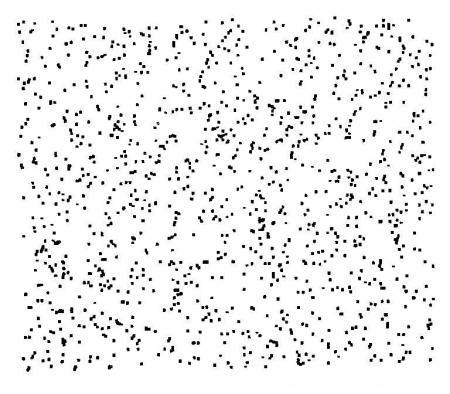 What’s the probability of a random distribution of dots looking exactly like that? Is it really evidence for the violation of the Cosmological Principle, or for the existence of the Cosmic Antipodes? For those of you who don’t get that gag, a cosmic antipode occurs in, e.g., closed Friedmann cosmologies in which the spatial sections take the form of a hypersphere (or 3-sphere). The antipode is the point diametrically opposite the observer on this hypersurface, just as it is for the surface of a 2-sphere such as the Earth. The antipode is only visible if it lies inside the observer’s horizon, a possibility which is ruled out for standard cosmologies by current observations. I’ll get my coat. Anyway, joking apart, the claims in the abstract of the paper are extremely strong but the statistical arguments supporting them are deeply unconvincing. Indeed, I am quite surprised the paper passed peer review. For a start there’s a basic problem of “a posteriori” reasoning here. We see a group of objects that form a map of Australia ring and then are surprised that such a structure appears so rarely in simulations of our favourite model. But all specific configurations of points are rare in a Poisson point process. We would be surprised to see a group of dots in the shape of a pretzel too, or the face of Jesus, but that doesn’t mean that such an occurrence has any significance. It’s an extraordinarily difficult problem to put a meaningful measure on the space of geometrical configurations, and this paper doesn’t succeed in doing that. It’s a pity that this note of realism didn’t make it into either the abstract or, more importantly, the accompanying press release. Peer review will never be perfect, but we can do without this sort of hype. Anyway, I confidently predict that a proper refutation will appear shortly…. P.S. For a more technical discussion of the problems of inferring the presence of large structures from sparsely-sampled distributions, see here. This entry was posted on September 13, 2015 at 2:02 pm and is filed under Astrohype, Bad Statistics, The Universe and Stuff with tags Cosmic Antipode, cosmological principle, Cosmology, Gamma Ray Bursts. You can follow any responses to this entry through the RSS 2.0 feed. You can leave a response, or trackback from your own site. A very sensible summary. I had pretty much the same opinion when I read the paper (which I actually only found out about when contacted by a science journalist wanting an opinion). I found it very amusing that the ring could simultaneously be “probably not a real structure” as in the sentence you quote, and yet “large enough to contradict the cosmological principle” as stated in the abstract. A brief sociological observation: in recent years there have been a number of papers claiming the detection of giant structures that “contradict the cosmological principle”. All of these papers have by chance been sent for peer review to members of a single research group. That they have all been passed fit for publication therefore reflects the opinions only of this one research group rather than being more broadly representative of what cosmologists in general think of them. I’d suggest it would be worth the journal editors diversifying a little! How do you know who the referees were? I think this is a good idea why the journal should publish the names of the referees along with accepted papers. Wouldn’t have helped in these cases, though. Would you deny it has the shape of your beard ? I’m surprised so many doubt that these excessively large structures are real. For decades numerous scientists have protested that they don’t believe the big bang created the universe. These oversize structures suggest that the big bang is but a local event that took place in a much older and larger universe. The evidence fits this old hypothesis quite well. Can you please include a reference to scientific paper that explains your hypothesis and how this “evidence” fits it? The latest version of the paper is called Back to Infinity and can be found at http://viXra.org/abs/1411.0113?ref=8588933. Earlier versions are at http://vixra.org/abs/1405.0250. This Big Bash model is clearly a better match for the evidence than the standard LCDM/Inflation model is. Did you find any area in which you believe the standard model better fits the observations or requires less unproven physics than the Big Bash model does? Yes, the light element abundances, the cosmic microwave background temperature and polarization fluctuations, galaxy clustering, gravitational lensing, galaxy evolution, etc etc. •	The standard model is a subset of the big bash model so the local light element abundances are essentially the same in the two models. •	The cosmic microwave background was predicted to be warmer than it was actually found to be. The big bash’s preexisting cold space helps to explain that deviation. •	There is no reason to believe there should be any difference in the observed polarization fluctuations between the two models. •	The big bash model provides a much more logical explanation for galaxy evolution and galaxy clustering than the standard model does. •	Gravitational lensing is the same between the new models. Your paper consists of 15 pages of garbled pseudoscience with not a single calculation relevant to any of the observations listed above or indeed anything else. Current theory is based on a 1927 religious assumption that the big bang created the universe. Every year we see more evidence that this was a faulty assumption and you have presented us a sample of that evidence. An infinite amount of precise math can never fix that dysfunctional model and a new paradigm is needed. The big bash model is a plausible alternative that, even if not mathematically precise, will stimulate the critical thinking necessary to right this sinking ship. Those who deny the existence of the problem and ignore the contrary evidence will never be able to fix it. Many of our brightest mathematicians have given up on the futility of cosmic calculations that use only proven physics and have resigned their focus to unproven physics and supernatural dimensions. Much of the problem stems from our hero worship of those who mathematically substantiate the phantasy physics that provides us some incredible edutainment. Without a logical model that works in the realm of real provable physics, the pursuit of better mathematics is just a red herring. Current thinking is not based on religion but on Einstein’s Theory of General Relativity. I’m sorry I wasn’t more clear. The founder of big bang theory was a brilliant Catholic priest by the name of Georges Lemaître. Not long after he presented his model he made statements that his model sprang forth from a “cosmic egg” or “primeval atom”. If he had ended his declaration at that point, I would not have anything to dispute. However, he went on to say “. . . prior to which neither time nor space existed”. It’s this follow-up statement that bears closer examination. I assure you, you will not find any rigorous science backing it up. It’s a totally unfounded assumption. It was certainly not an unreasonable assumption, but nonetheless it was totally arbitrary. This assumption defines the box that theoreticians are not able to find their way out of. It’s their absolute devotion to this dogma that locks them into their creationist model. If it walks like a religion and it quacks like a religion, I hope you can find it in your soul to forgive me for calling it a religion. My point is that the evidence you presented and much more similar evidence is either totally misleading us or the big bang is really just a local event in a much bigger universe. If the latter is the case, then virtually all of the standard model’s most mystifying anomalies instantly find realistic solutions that don’t require the deployment of make-believe physics. I presented this hypothesis to the Spokane Astronomical society a couple of weeks ago and it was amazing to see the number of light bulbs that were turning on. I would encourage all of the critical thinkers in your audience to judge for themselves whether or not it takes a mathematical genius to see the flaw in the standard model of the universe. They’ll find that discussion at http://ghmickeythompson.com/. I’d love to hear their feedback. Presumably GHMT has been led astray by the fact that Lemaitre was a priest. (One often reads that he was a Jesuit, but this is not true.) However, Lemaitre was careful to separate his science from his religion. In any case, the idea of an initial singularity in general-relativistic cosmological models was not original with him; it is implicit in the work of Friedmann and even de Sitter and Einstein, although Lemaitre did emphasize the potential importance of the “cosmic egg”. Lemaitre or no, his statement about the singular origin of the universe follows from GR. So, if you want to debate this, debate GR, not Lemaitre. Also, again, you imply that Lemaitre let his religion influence his science. All the evidence is to the contrary. Don’t be distracted by superficial similarities. No-one actually believes that there is a real singularity corresponding to the big bang, but we don’t know what happened there. However, we are pretty sure what the universe was like even a fraction of a second after the time corresponding to the similarity.